The Rev'd C ANON ALAN BENNETT, retired from full time ministry in the Oxford Diocese in 2007 and now living in this area, has received "Permission to Officiate" in our churches. Born the son of a Plasterer in September 1942 in the shadow of a bombed church in Portsmouth, his mother and the doctor were surprised to be told by the mid-wife that his twin brother was about to be born. They went to the local school, and under the influence of an Aunt, went to another bombed church where they didn't call the Vicar Father, nor use incense! It was at St. Cuthbert's that he found his faith and calling. The Monastic Order of the Sacred Mission at Kelham in Nottinghamshire took in boys at 16 to give them further education. Alan had gained three GCEs, one in Bricklaying! He went to Kelham in 1959 and enjoyed the Monastic life there. The following year he went to Sheffield to work in the steel industry. "A chance to see how the working class lived", was how the Industrial Mission Chaplain described it. He returned to Kelham in '61 to start the four year course in Theology. At the end of the second year he failed the exams and returned home to work in a plastics factory for the next two years. He became a Lay Reader in '64. Salisbury Theological College took him on, this time passing the exams. In '68 he was ordained in Portsmouth to a title in Fareham. Three happy years followed "learning the trade" under Simon Burrows, later to be the Bishop of Buckingham. Two parishes in Brighton completed his training. In 1975 he met Barbara who had just been left widowed and pregnant with her first child. An unusual courtship followed! Alan was offered the Parish of Sandown in the Isle of Wight where they went after their wedding to start a new life. Their second son Christopher was born there. In '80 they moved to two parishes in Hampshire where their two daughters Rachel and Alexandra were born. In 1987 they went to Aston Clinton in Buckinghamshire and stayed until retirement. He was area Dean for ten years and spent fifteen helping in the local prison. He was also Vice Chairman of the Buildings Committee looking after Vicarages. 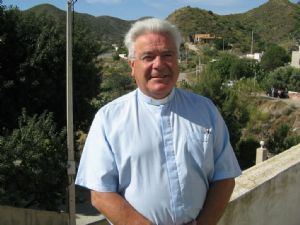 He has also been involved in Iona for seventeen years, taking groups and going on retreats. Sadly, Barbara developed cancer in 2000 and died in 2002. The children are now grown up of course, and Alan has four grandchildren.